Pittsburgh is one of the cities I have wanted to visit for years. Why? Difficult to explain, but I guess it has a lot to do with me being a map geek. I often study maps of cities or, I would rather say, virtually travel on them. Pittsburgh’s layout looked interesting to me from the first glance at the map of Pennsylvania. Its compact downtown is located on a triangular patch of land at the confluence of Allegheny and Monongahela rivers, where they form the Ohio River, while its neighbourhoods and suburbs spread out over many steep and wooded hills. Also, as a person who has a mild obsession with bridges, I couldn’t miss the fact that Pittsburgh features over 440 of them. So, when I was planning my latest US adventure, I made sure the Steel City was on my itinerary. One of the best approaches to Pittsburgh is following the interstate 376 from the south-west. Just before getting to the downtown you enter the short Fort Pitt Tunnel from which you drive directly onto the top level of the double-deck steel arch of Fort Pitt Bridge. At that moment a great panorama of the downtown skyscrapers opens up. What makes the experience even better is how suddenly and unexpectedly it all happens. One minute you are driving in the dark and boring tunnel and then, bang, comes the view! At this moment it make sense to mention that you have to try to pay attention to the road as there is a complicated junction just after the bridge, which you can miss in the blink of an eye and end up on another great bridge, but going the wrong way, out of the downtown. The best place to get an overview of the city’s layout is from one of the few viewing points in the neighbourhood of Mount Washington, which is located just across the river from the downtown on a steep hill. To get there you can use one of two historic funiculars or drive around the steep, San Francisco-like, streets. It is a bit tricky to navigate all the way to the top but you should do it as the panorama of central Pittsburgh from there is absolutely fantastic, probably one of the best urban views in America, if not in the world. Mount Washington and other neighbourhoods of the, so called, South Side are well worth a walk around. It was once an area composed primarily of dense inexpensive housing for steel mill workers, but has in recent years become a local destination. There is plenty of greenery, streets are narrow and old wooden houses dominate the street scape. It feels a bit like a less posh, less pretentious and greener version of San Fran. Central Pittsburgh, also called the Golden Triangle, is tight and compact featuring many skyscrapers. The U.S. Steel Tower is the tallest one of them, but the most distinctive one is the PPG Place, a Gothic glass complex featuring 231 glass spires. It really is a great sight. As such the downtown is devoid of typical tourist attractions but it is still worth some exploration. Next I headed east towards the University of Pittsburgh campus located in the Oakland neighbourhood. It took me much longer to get there than I had anticipated because I got lost in a web of narrow, often one way, streets which were not organized in any logical grid. Very un-American like and frustrating, especially in the rain. 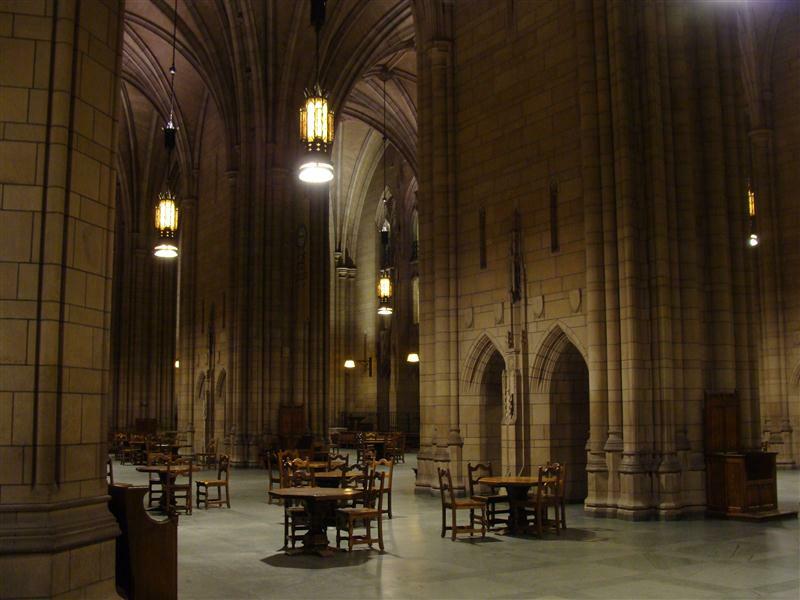 But I finally managed to find what I was looking for, the Cathedral of Learning. This strangely named building is one of the world’s unique educational buildings. It is also the second tallest after the main building of Moscow State University. But what makes it unique is its interior, especially the Commons Room, called one of the “great architectural fantasies of the twentieth century”, a fifteenth-century English perpendicular Gothic-style hall that covers half an acre (2,000 m²) and extends upwards for four stories, reaching 52 ft (16 m) in height. It is a piece of true neo-Gothic architecture; no steel supports were used in the construction of its arches. Each arch is a true arch, and they support their own weight. There is no visible security and you can wander around the building unmolested. I even managed to get to some of the rooms on the 36th floor from where I should have been able to see a great panorama of western Pittsburgh. I said “I should” because it was rainy ad misty during my visit and I couldn’t see too far at all. One more attraction I have to mention, even if I didn’t visit it myself, is The Andy Warhol Museum. Located on the North Shore, the museum holds an extensive permanent collection of art and archives from the Pittsburgh-born pop art icon Andy Warhol. For many people it might be a highlight of their visit to Pittsburgh but I prefer the city’s industrial and architectural heritage. So, instead of mingling with the artsy types, I drove to a really gritty part of town to see one of its most fascinating bridges, the George Westinghouse Memorial Bridge. Opened in 1932, the bridge features five reinforced concrete parabolic arches and carries the US Hwy 30 over the Turtle Creek and railway tracks. It is a truly beautiful structure but to find a good vantage point I had to navigate some properly rough industrial landscapes. Remember the Deer Hunter, the movie? 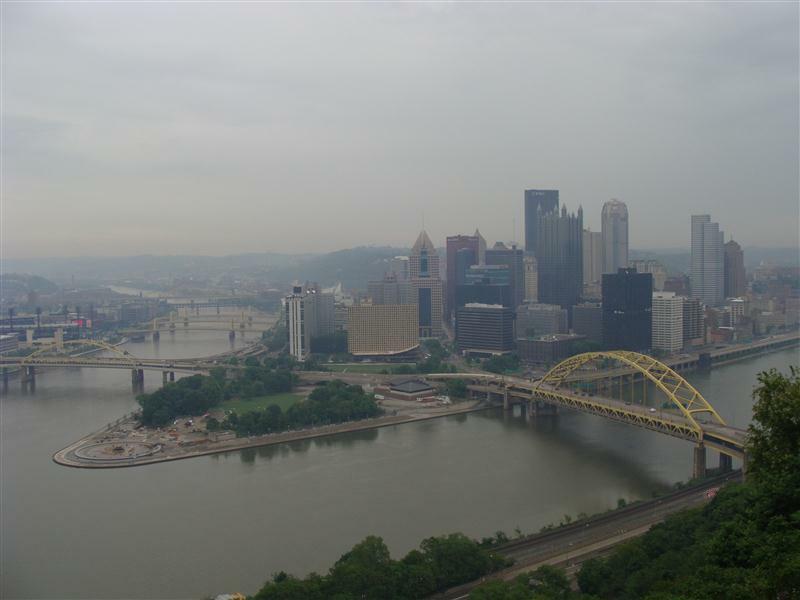 Yep, parts of Pittsburgh still look like that, especially on a grey and rainy day. Which only makes it more fascinating. I really like Pittsburgh. It is a great example of a city which was once dominated by heavy industry but managed to reinvent itself rather well after its decline. It is a big contrast to Detroit, where closing car factories brought this once-great city to a near collapse. Some look back with nostalgia to the golden industrial era but it wasn’t that golden at all. Pittsburgh was once one of the dirtiest places on earth; its air was so badly polluted by the steel mills that the street lights were left on during the day. Nowadays the steel mills are gone so its air and waters are much, much cleaner and its economy has become modern and diverse. But the Steel City still retains its down to earth feel even if modern technology workers occupy many of the old steel workers’ houses. There are still some industrial landscapes to be explored and not everything has been changed into hippy galleries or eateries. And of course all the Pittsburghers, from doctors and IT engineers to the few remaining steel workers, together support some of the best sport teams in America, especially the Pittsburgh Steelers, the most successful team in the history of the NFL and the pride of the city. Once you are in Pittsburgh there is one more attraction you shouldn’t miss. 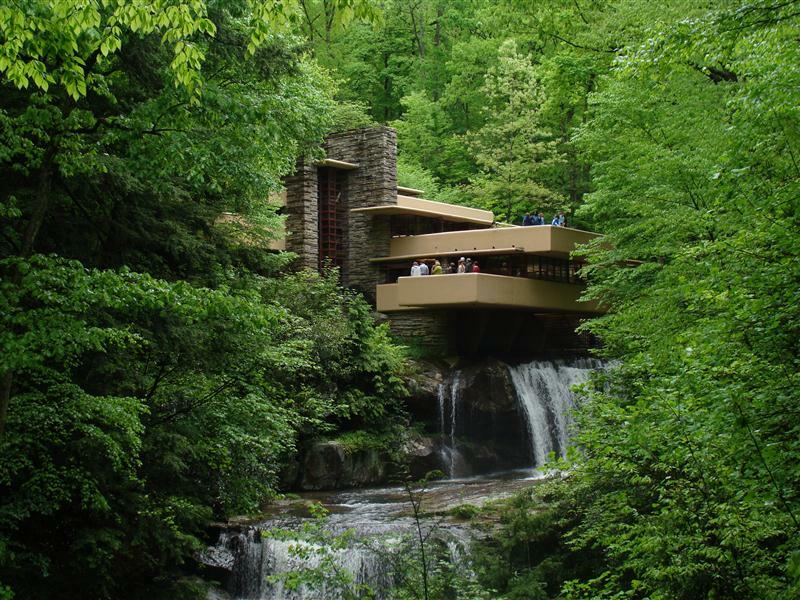 Located about an hour and a half south-east of the city, deep in the rural landscape of the Laurel Highlands, is the architectural wonder of Fallingwater. It requires a bit of an effort (and a good map) to navigate the small highways leading there, but it is worth it. Designed by architect Frank Lloyd Wright, Fallingwater was completed in 1937 as a weekend home for the rich Pittsburgh family of Kaufmann. Being a fan of American architecture I had obviously read about it and seen pictures of it, but nothing could prepare me for the sublime beauty of this masterpiece. Boldly located on top of the waterfall, which actually flows beneath the house, it is absolutely fantastically integrated with its striking natural surroundings. It consists of several cantilevered concrete terraces (including a large living room) stretching a good few metres and anchored to the massive central stone chimney. It looks absolutely fantastic in the lush green Pennsylvania forest. Wright also designed every single detail of the interior and all the furnishings. I could honestly write page after page about Fallingwater but no amount of words would be enough to describe it. Even pictures can’t show its real beauty. You simply have to see it yourself. From Fallingwater I headed east and after all day driving in, at times torrential, rain I was getting close to another great city, Philadelphia. But more about it another time. This entry was posted in Uncategorized and tagged Cathedral of Learning, Fallingwater, Fort Pitt Bridge, Frank Lloyd Wright, George Westinghouse Memorial Bridge, Golden Triangle, Mount Washington, Pittsburgh, PPG Place, Steel City on August 26, 2012 by admin. Glad you enjoyed your trip to Pittsburgh! I love reading posts about people’s first time here – you did a great job of capturing some of its best features! Thanks, I really enjoyed Pittsburgh. Wanted to go there for a long time and wasn’t disappointed.